Thailand with its rich food background and colorful culture has been voted as the must- visit destination for all adventures once in their lives. This country has a unique food culture which appeals all travelers of all kinds. 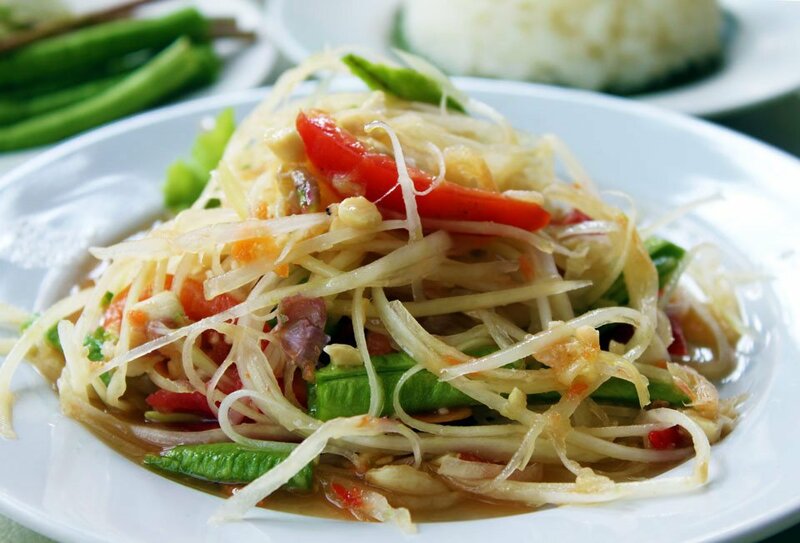 Thai food is so popular and diverse that you don’t need to make any effort to find a good place to have a meal. The possibilities for Thai food is endless but in this article, we will pick out top 5 special foods you all have to try when visiting Thailand. It is a stir-fried rice noodle dish made with soaked dried rice noodles, which are stir-fried with eggs, fish sauce, dried shrimp, garlic or shallots, red chili pepper and palm sugar, and served with lime wedge.. It may also contain other vegetables and raw banana flowers. 313 Mahachai Road, Old City (close to WatSaket), Bangkok. You can mention the word “Pad Thai Pratu Phi” to your driver. Bang Pae Seafood restaurant: PA Khlok, Thalang, Phuket. Somtum Der is a very agreeable venue with an extremely friendly team, a great place to take a friend or a group of friends for some great classic som tum in a youthful atmosphere. The rich coconut milk base paired with chunks of chicken, round Thai eggplant, and chillies is a recipe for ultimate culinary comfort. PLAN A TRIP TO THAILAND with Justgola now.